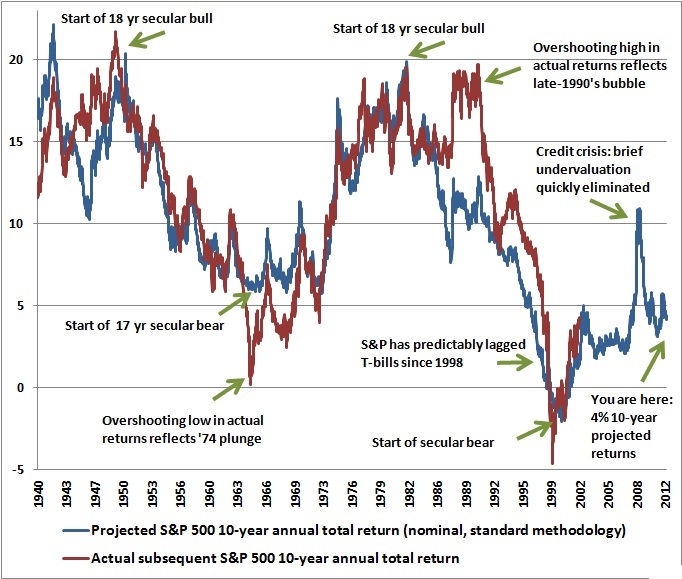 There are a number of studies on the estimation of long-term returns to stocks. Ignoring the empirical research momentarily, the best explication of the estimation of long-term returns is by John Hussman in his article Valuations Matter. The logic is straight forward. Consider, for simplicity, a 30-year zero-coupon bond with a face value of $100. If the bond is priced at a yield-to-maturity of 10%, it will cost you $5.73 today. Over the coming 30 years, the price will advance to $100, and your annualized return will be 10%. Just what you bargained for. But what happens in the meantime? Suppose that over the first 10 years of your holding period, interest rates decline, and the yield-to-maturity on your bond falls to 7%. With 20 years remaining to maturity, the price of the bond will be $25.84. Now here’s the crucial point. Even though the yield-to-maturity for the remaining life of the bond is just 7%, and the yield-to- maturity you bargained for when you bought the bond was only 10%, the return you have earned over the first 10 years is an impressive 16.26%! By holding the security during a period when the yield-to-maturity is falling, you not only earn a return that is higher than the original yield to maturity, you earn a return that is dramatically higher than the future yield-to-maturity! Now, the rest of the story. Over the remaining 20 years of the bond, you will not earn 16.26% annually, but 7% annually. If you do the math, you will find that over the entire 30 year holding period, you will have made — surprise — 10% annually. Just what you bargained for originally. For stocks, the “yield-to-maturity” comes from two components: income plus capital gain. The income component is simply the dividend yield. Assume initially that the dividend yield is held constant over time (we’ll relax this assumption in a moment). If the dividend yield (Dividend/Price) is constant, then by definition, prices must grow at exactly the same rate as dividends grow. By definition, when the dividend yield is unchanged between the date you buy stocks and the date you sell them, your total return equals the dividend yield (income) plus the growth rate of dividends (capital gain). As a rule, a good estimate of the “yield-to-maturity” on stocks is the 6% long term growth rate plus the dividend yield. But remember, your actual return will only be equal to this value if the dividend yield stays constant over the period that you hold stocks. As we saw in our example, if the yield falls during the period you are holding stocks, your actual return will be even higher than the yield-to-maturity that you bargained for. On the other hand, if the yield on stocks rises over your holding period, your actual return will be even less than the yield-to-maturity you bargained for. Historically, the dividend yield on stocks has averaged about 4%, and has fluctuated both above and below this 4% figure. As a result, the historical average return on stocks has typically been 6% + 4% = 10%. That’s precisely where that 10% “historical return” on stocks comes from. Where Original Yield is the original dividend yield (in decimal form), Terminal Yield is the dividend yield expected at the end of the holding period, N is the holding period in years, and g is the growth rate of dividends over the holding period. Currently, assuming dividend growth speeds up to a 6% rate and that the dividend yield is still just 1.4% in the future, the long term total return on stocks will be 7.4%. But here’s a more likely result: suppose the future dividend yield rises even a bit, even to just 2%. If that happens over the next 5 years, investors will earn a total return of zero over those 5 years. Over the next 10 years: just 4% annually. Over the next 20 years: 5.8% annually. Over the next 30 years: 6.4% annually. If the dividend yield rises to the historical average of 4% even 30 years from now, investors will have earned a total return of just 5% annually over that span. Consider that figure long and hard before trusting your retirement plans to a buy-and-hold approach in stocks. It’s now 14 years since Hussman wrote the article. As difficult as it would been to believe it at the time, if anything, it seems at this point that Hussman was too optimistic. You want to own stocks when the yield on stocks is high, or while favorable market action (interest rates, inflation, market breadth) are uniformly driving the yield downward. Beware when neither is true. Tomorrow, I’ll show some estimates for the market as it stands now. For example, cash-focused measures, such as free-cash-flow, might perform better during economic downturns than accounting-focused measures like earnings. Or perhaps a more asset-based measure, like book value, will outperform when the economy is more manufacturing-based (‘70s and ‘80s), and struggle when the economy is more human capital and services oriented (therefore making asset-based measures less relevant). Gray and Vogel analyze the returns of different price ratios over economic expansions and contractions defined by the National Bureau of Economic Research. B/M enjoys periods of relative out-performance in the early ‘70s, early ‘80s, and in late 2009. 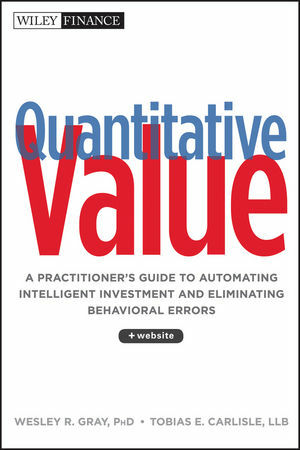 The B/M performance pattern lends weak evidence to the hypothesis that balance-sheet-based value measures perform better than income or cash-flow statement value metrics when the economy generates more returns from tangible assets (e.g., property, plant, and equipment) relative to intangible assets (e.g., human capital, R&D, and brand equity). 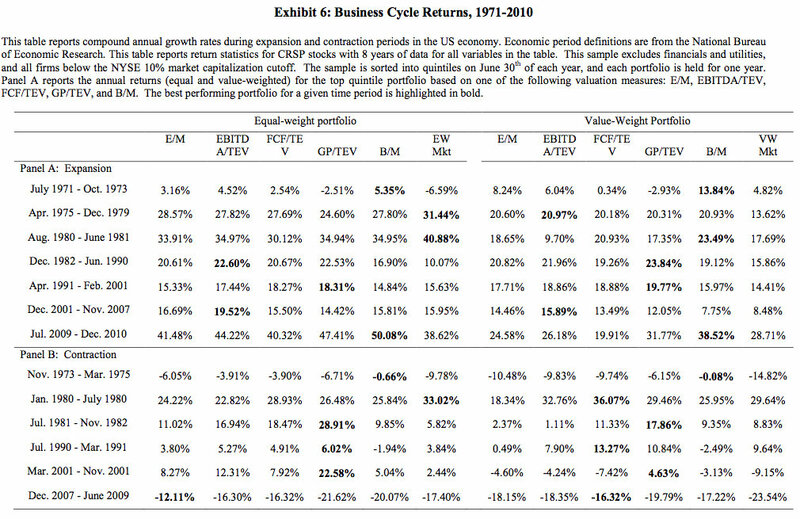 Overall, there is no strong evidence that a particular valuation metrics systematically outperform all other metrics during expanding economic periods. 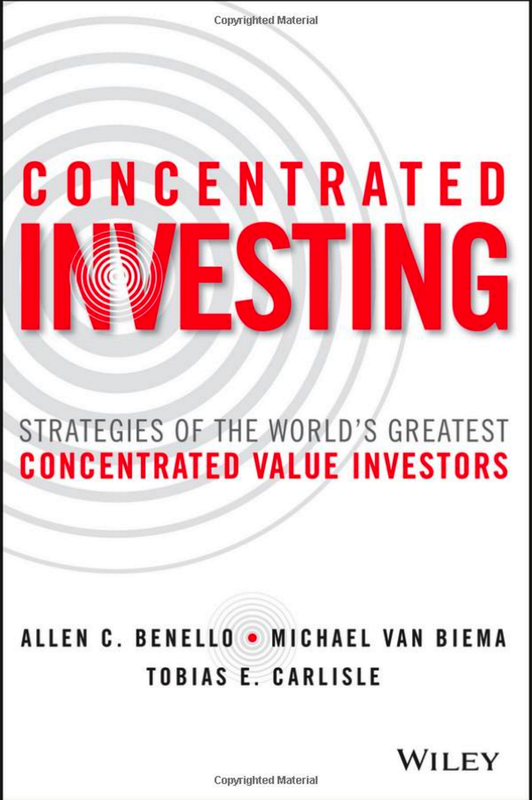 [The] results in Panel B suggest there is no clear evidence that a particular value strategy systematically outperforms all other strategies in contracting economic periods. For example, during the July 1981 to November 1982 and March 2001 to November 2001 contractions GP/TEV shows strong outperformance, but this same metric has the worst performance in the December 2007 to June 2009 recession. [There] is little evidence that a particular value strategy outperforms all other metrics during economic contractions and expansions. However, there is clear evidence that value strategies as a whole do outperform passive benchmarks in good times and in bad. The one exception to this rule is during the April 1975 to June 1981 business cycle, a time when a passive small-cap equity portfolio performed exceptionally well.